Stains on the carpet are not a pretty scene but neither are they easy to get rid of. Instead of hiring a carpet cleaning service, you can use a product that is in your home. Rubbing some alcohol, preferably clear vodka or some white wine, will save you the trouble. Start off by blotting the stain. Next, pour the vodka onto to the stain so as to do away with it. This cleaning tip beats most of the over-hyped counter products. If you are looking to have your tile floor looking like it is new again, you need not pull your hair anymore over that. After vacuuming the floor, a rag, a bucket of water and some light detergent will do the job. Do a thorough job scrubbing. Also, ensure that you clean the rag frequently and use clean water so that you donâ€™t end up pushing dirt over the tile floor. If the floor has some tough spots, use a toothbrush to get to them. Appliances made of stainless steel often get stained by fingerprints. Luckily, bringing them to a clean shine is not hard. 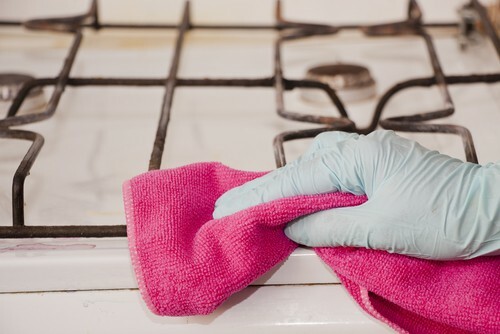 Armed with a microfiber cloth or a soft cloth for that matter and some alcohol, you should have the appliances looking as good as new. If you want them to look super clean, you can also use a few olive oil drops to boost your effort. Other ways to have them shine include cleaning the surface with some dish soap and water, drying the wet spots and then dabbing a second cloth with some drops of mineral or baby oil to give it a shine. You can also spray the appliance with some WD-40 and then wipe it off using a soft cloth. Of the most neglected rooms of the house, the bathroom is pretty high on the list. Seldom do people spare time in their schedule to clean it up. If you fall in this category, youâ€™re in luck for there is a home cleaning tip for you to get rid of grime and soap scum that may be building up in your shower. With the aid of some dish soap and vinegar, fill a dish wand with these two and start scrubbing. If you donâ€™t have a dish wand, you can use a toothbrush or an old sponge by dipping it into the solution and then scrubbing. The couch is often a candidate for lingering smells and stains that manifest on the fabric. Well, you can get rid of these smells and stains using baking soda. Start off by brushing the couch surface before proceeding to sprinkle the area you intend to clean with baking soda. Afterwards, let the baking soda sit for around 20 minutes after which you can vacuum the couch with the brush attachment. With continued use, the microwave is prone to food stains and this calls for some cleaning. With some essential oils, you should have the microwave looking fresh and clean. Add one and a half cups of water into a microwave-safe bowl. Add about 15 drops of lemon essential oil into the water and then microwave it on high for about five to ten minutes. Let the steam condense on the inside ceiling and walls. Once time is up, wipe away the now softened food stains using a sponge. Grease on the oven and stovetop makes for an ugly sight that needs to be dealt with with the utmost urgency. Grease also leads to kitchen fires and this is the more reason to get rid of it. This is the job for lemon essential oil. In addition to its wonderful scent, lemon essential oil also works great in getting rid of grease stains. Create a mixture of one cup vinegar, one cup water and some lemon essential oil and spray in onto the stovetop or oven. Wipe it clean afterwards. If the event of tougher stains, sprinkle some baking soda prior to spraying the mixture. The tub is also prone to collecting scum but you need not fret about it. With this cleaning tip that involves some vinegar and baking soda, you should have a sparkling tub in no time. First, make a mixture of one cup vinegar, half a cup baking soda using some hot water and pour it into your empty tub. Let the mixture sit for five minutes. Two, fill the tub with some hot water until it is one-quarter filled, and let it be for another five minutes. Afterwards, release it to drain and rinse the tub thoroughly. The garbage disposal is subject to dirty work regularly and so you will have to clean it and ensure that it is clog-free. With a fresh lime or lemon, you should be able to not only clean but also deodorize it. Simply slice the fruit into four pieces and with the water running, throw the lemon pieces, one piece at a time, into the disposal. Shower glass often gets blotted with water stains. You can use some shaving cream to clean these water stains. Apply the cream on the stains and let it be for about 15 minutes before wiping it off. As you have probably noticed, most of the cleaning tips here involve products that you can find in your cupboard or drugs cabinet and this saves you the trouble of having to buy expensive cleaning agents. Also, these home cleaning tips work within a short span of time if not instantly, freeing you up to embark on other duties. In conclusion, share with us any other home cleaning tips that you use in your home! Cleaning it the right way for you! Satisfaction guaranteed! How to remove pet urine smell on mattress? © 2019 cleaningservice.com.sg. All Rights Reserved.